British heavy Infantry Tank Mark I, first tank in history. The thought of the armoured ‘landship’ had been quite nicely well-known in fiction prior to 1914, and suggestions to develop this type of machine had been intended to practically every significant military in Europe, along with the British War Office. Not any of these plans had been adopted for the easy cause that there appeared to be simply no necessity for this type of machine, however right after 1914 that become different. Some far-sighted military and other people pointed out that the circumstances established on the Western Front could only be beaten by the employment of mobile armoured machines. One of these first prophets was Colonel E.D. Swinton, who made use of his position of influence to focus authorities in the idea. Consequently a War Office committee had been created to check out a few suggestions, nevertheless its attempts came to practically nothing. Certainly not discouraged, the Royal Navy took assist since it’s Royal Naval Air Service armoured car squadrons had at least had some expertise of armoured warfare in 1914. From their experience emerged several suggestions that included the use of a ‘big wheel’ vehicle with huge wheels that could cross trenches. At this time Winston Churchill grew to become more than fascinated and established what was to become called the Landship Committee to analyze methods for crossing the French battlefields. The American Holt tractor served as the inspiration for the trials vehicles. The tracks were very similar to those adopted for use on ‘Little Willie’. The ‘big wheel’ vehicle received the development go-ahead, and also the focus of the committee had been attracted to one more machine called the Pedrail which utilized a large central track transporting any kind of load or power plant above it. That as well had been directed for tests, plus more devices of the caterpillar track type were purchased for experimental work. There were a number of these like the Killen­-Strait tractor, a Bullock Creep Grip tractor along with a peculiar purpose-built device that embodied the wheels of a Daimler-Foster tractor and was called the Tritton Trench-crossing Machine. Not any of these devices had been considered suit­able for the task, the identical judgement end up being the Pedrail, which turned out to be much too complicated a vehicle to cross rough terrain. The Bullock tractor appeared to provide far more hope, a pair of this kind of vehicles being particularly purchased from the United States. Being mainly an agricultural device, the Bullock couldn’t be categorised as fundamentally acceptable, nevertheless its tracks did provide a method through mud and wire. Consequently Mr William Tritton (later knighted for his assistance) of Foster’s of Lincoln had been instructed to overhaul the tractor. This guy had been the individual that had been active in the develop of the Tritton Trench-crossing Machine following the ‘big wheel’ design had been discarded. ‘Little Willie’ in pristine form at the Willaim Foster and Co works in Lincoln, complete with the original form of wheeled steering tail. Tritton consequently made use of the Bullock track and suspension and created the ‘No.1 Lincoln Machine’. This creation was much more offering, however the track had been too small and gave continuous issues. A fresh track and a few additional improvements resulted in the vehicle afterwards called ‘Little Willie’ in December 1915. ‘Little Willie’ had been the original British tank, despite the fact that in those days the word wasn’t created. 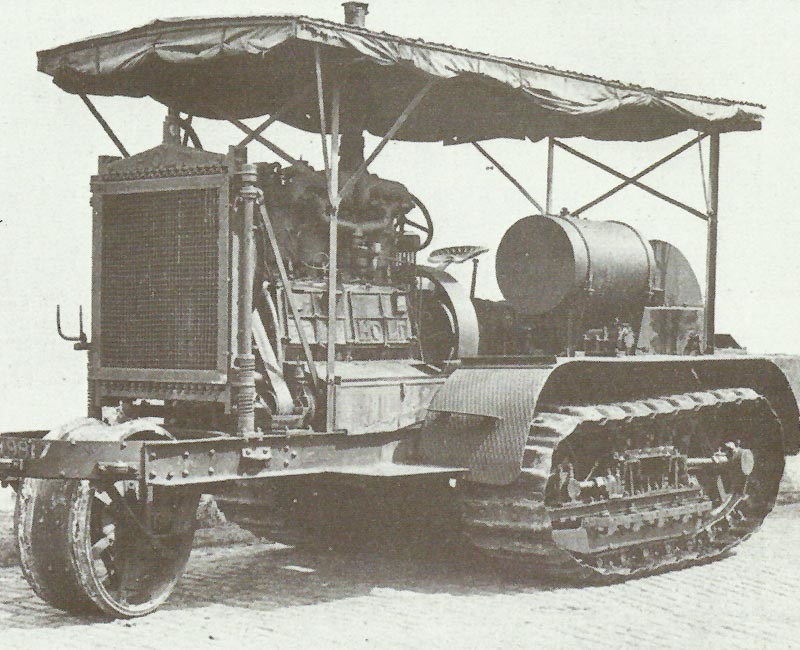 Even though it seemed to satisfy the Landship Committee require­ments, ‘Little Willie’ remained too unreliable together with almost no obstacle-crossing functionality, so a Lieutenant Wilson, who had previously been working with Tritton at the behest of the Landship Committee, developed the concept of significantly enlarging the tanks into an ‘all-round’ kind that came to look like the lozenge shape that epitomized the tanks of World War One. The box shape of ‘Little Willie’ was consequently modified to match the new track outline and the vehicle became ‘Mother’. ‘Mother’ shows her paces in Poppleton’s Field, Lincoln. With ‘Mother’ the War Office once again started to be attracted, and after de­monstrations held in Hatfield Park in January 1916 the design was authorized. The Landship Committee was then improved to turn into the Tank Supply Commit­tee, for in an effort to disguise the supposed function of the new device the codename ‘water carrier’ and finally ‘tank’ was used; the second name was the one that stuck. 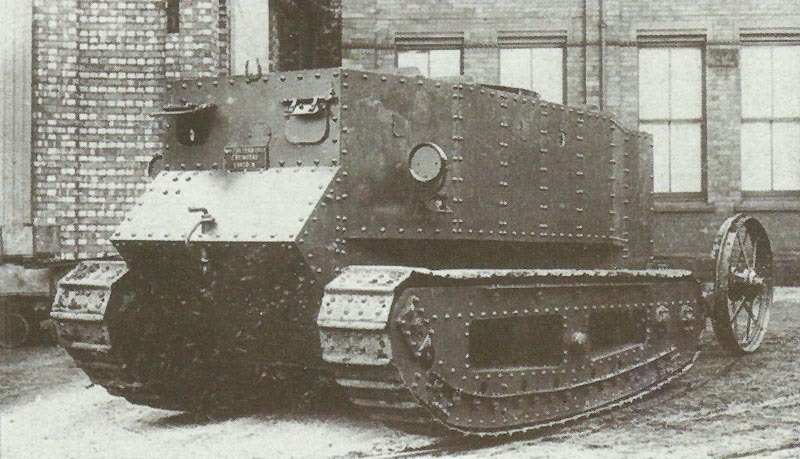 ‘Mother’ was adopted as the prototype for the vehicles that afterwards became the Tank Mk I. An order for One hundred had been placed in February 1916 and the tank had appeared. The Mk I was the fabrication and operation version to the prototype vehicle called ‘Mother’, which was the final out­come of a number of development mod­els that were initially in line with the use of a Holt tractor chassis. The moment ‘Mother’ was manufactured, the initial Holt type had been absorbed by operational specifications that required enormous trench-crossing capabi­lities that the Holt design could in no way accomplish. Lieutenant W. G. Wilson was the key responsible for the ultimate type of ‘Mother’ following a lot of committee and experimental work, and it was he who created the concept of utilizing the huge and large track out­line having its typical appearance that to be the classic tank shape of World War One. ‘Mother’ had been displayed in ]anu­ary and February 1916, and shortly following this the first manufacturing request was submitted. 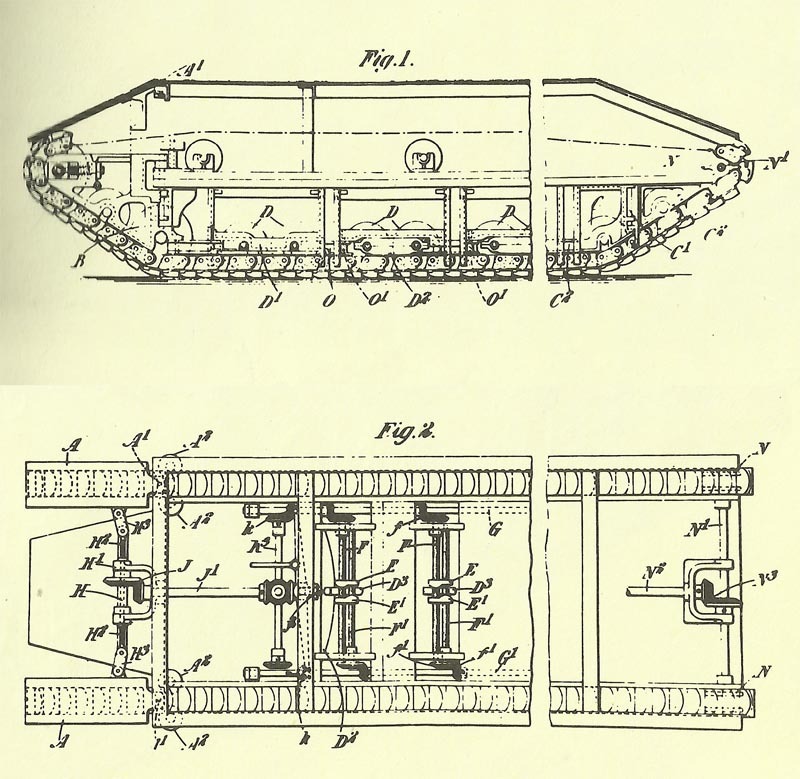 An individual arm was estab­lished in March 1916 to operate the revolutionary vehicle, which was known as the ‘tank’, simply as a cover, however the term stuck and is still in use. The initial pro­duction tanks were supplied to the Heavy Section, Machine-Gun Corps in mid-1916, and the first crews were assembled and trained. The Tank Mk I was a huge and heavy monster operated by just one Daimler 105-hp (78,3-kW) petrol engine held in an armoured box slung between the a pair of enormous lozenge-shaped continuous tracks. initially it had been designed to install a turret on the top however this would have made the design unstable so in­stead the main armament of a pair of 6-pdr (57-mm) guns was installed in one spon­son on each side. The sponsons each had a single Lewis or Hotchkiss machine-gun, along with a third such gun had been equipped for additional defence. The 6-pdr (57­-mm) guns had been ex-Admiralty cannons as the army wouldn’t provide an armament when demanded. The vehicle was protected by armour plate (varying in thickness from 6 mm/0.24 in to 12 mm/0.47 in) riveted to metal joists, however in battle this turned out frustrating as bullet ‘splash’ found its way through the armour seams and resulted in casualties in order that the crews adopted to carrying chain mail facial armour. 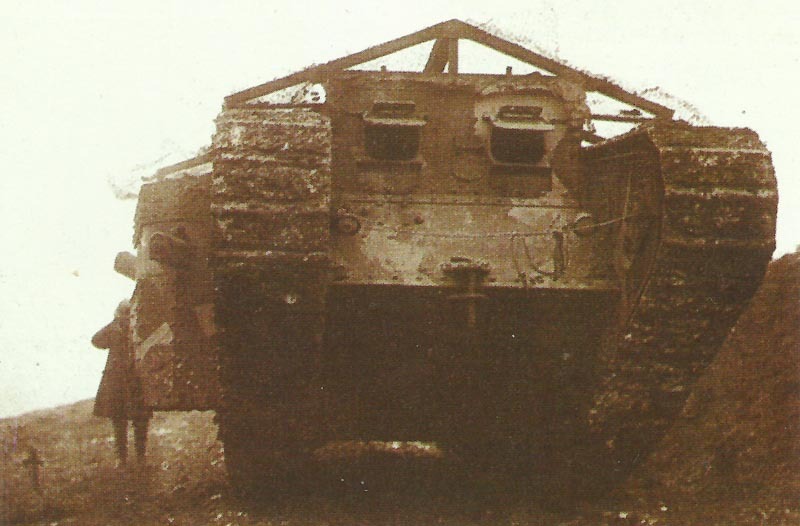 The Mk I could cross trenches up to 2.44 m/8 ft wide, and steering was at first achieved by employing exterior twin-wheel ‘steering tails’ that turned out to be pointless: in battle they were commonly destroyed, however the vehicle could continue to be steered. A Tank Mk I (Male) moves up into action near Thiepval in September 1916. Nearly as soon as the first tanks arrived in France in mid-1916 they were directed into battle, even though the tanks continued to be full of mechanical ‘bugs’ as well as their crews were merely skilled. Thus the first Mk Is moved into action on the morning of 15 September 1916 at Flers­-Courcelette in a useless effort to pro­vide a bit of energy to the flagging Somme Offensive that had been under way since July. Despite the fact that were utilised locally in ones and twos, the vehicles did manage to make some local break­throughs and created panic when they appeared. However the miserable reality was that too few in fact got into action. A lot of the projected 50 that were intended to make the assault purely broke down en route to the front, while others were promptly bogged down in the mud that prevailed in all places. Single tanks did make deep Impressions into the German line however they were too few in number to create any kind of significant effect. This Tank Mk I (Female) is coming out of the battle near Flers-Courcelette on 15 September 1916 after the first-ever tank action took place there. and the Tank Mk I (Female) with bigger sponsons and an armament of 4 Vickers and 2 Lewis machine-guns and created for the anti-infantry support of the Tank Mk I (Male). Other models were the Mk I Tender with mild steel boxes instead of the sponsons, and the Mk I Wireless Tank without having sponsons but with a high aerial mast. Consequently the Mk I made history by being the first tank to be used in com­bat, however it had been something of a disaster as far as the battle was troubled. What the type did acquire ultimately was to attract on the British military hierarchy the point that the tank did have potential, more resources and facili­ties being afterwards redirected towards the ‘Tank Corps’ which was properly estab­lished in July 1917. When the first Mk I tanks had been sent into battle along the Somme in the autumn of 1916 they were not really prepared in relation to exercise and as to the mechanical performance of their vehicles. As if this weren’t sufficient, the tanks were asked to accomplish marvels. They were spread in ones and twos across the front but remained supposed to deliver the magical strike that would crack the German lines. To perform this they were expected to cross their way throughout shell-torn terrain which was so wet that it swallowed artillery trains without trace, and to best it all in certain places the tanks were forced to cross swollen rivers or streams. The tank officers pleaded useless for some kind of logic to be drilled into their orders, however the military brain at the time was such that attrition took over as regular tactic, and the tanks were simply another helpful tool for this sys­tem. 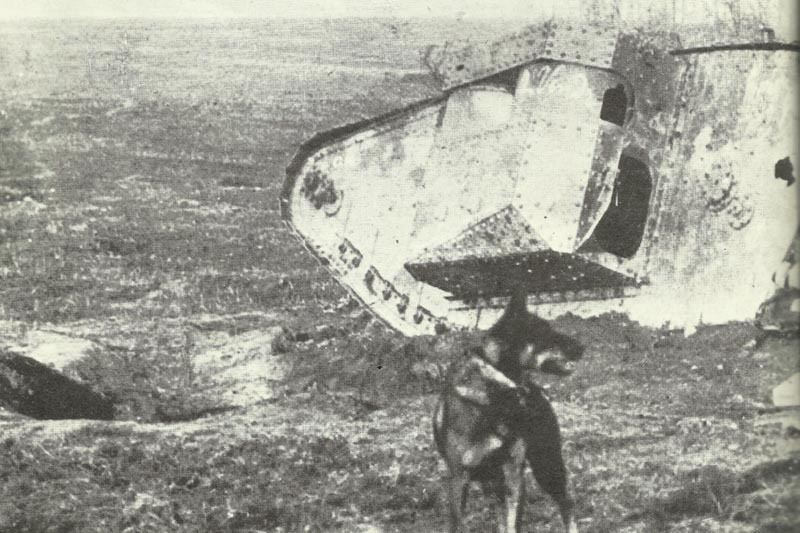 Knocked-out Mark I tank of the C Company near the forest of Bouleaux. Clearly visible is at the right the entrance hole of the shell into the side. The Somme offensive shuddered to a bloody hilt during the last days of 1916. 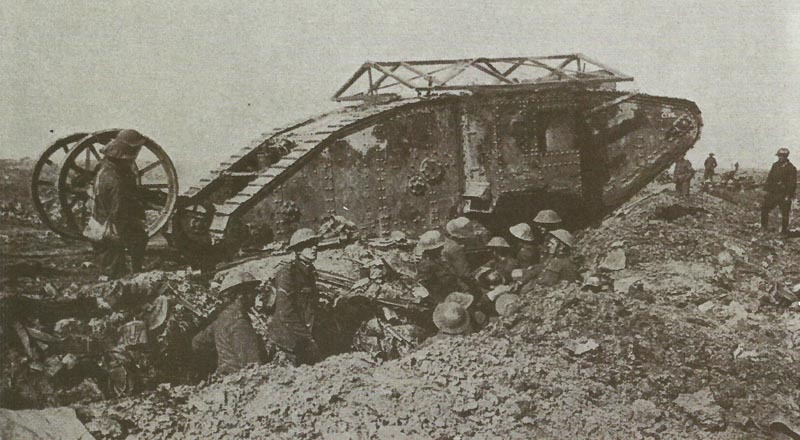 An excellent chance to make use of the tank to get affordable result had been sacrificed along the Somme, and currently the Germans had been checking out the handful of tanks taken across the Somme and making a specific armour­percing bullet to penetrate the armour. The moment the Mk I and the handful of new Mk IIs entered battle once again at Bullecourt in the snowfall of 11 April 1917, these fresh armour-piercing rounds were active, demonstrating successful to the extent that a few tanks were lost. Afterwards every German sol­dier stocked a minimum of 5 rounds of the new ‘K’ bullets as well as machine-gunners received far more. Engine one 108-hp (78.3-kW) Daimler petrol engine with 1,000 rev/min.